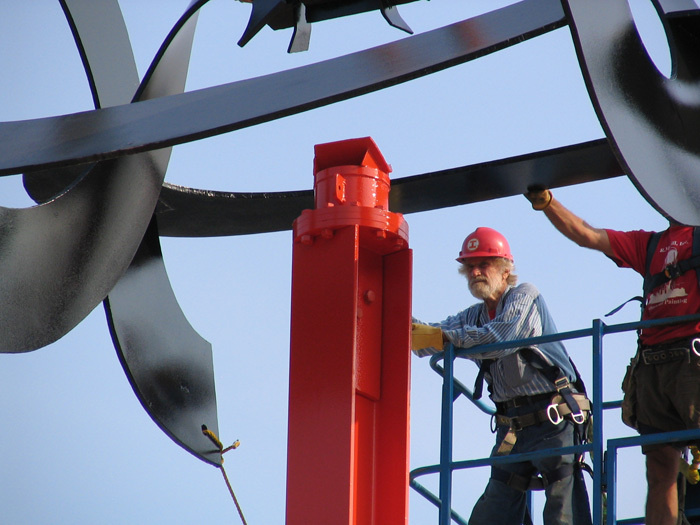 Mark Di Suvero (above), who divides his time between New York, California and France, was in Manchester, New Hampshire, Thursday to oversee installation of his 35-foot-tall sculpture “Origins” (2001-04) at the Currier Museum. I'm told the sculpture's top gently spins and rocks in the wind. The institution is closed during expansion work that is expected to be completed in time for a reopening in April 2008. “Origins” (pictured below) is meant to be the centerpiece for the museum’s new entrance court. There are a few other di Suveros hereabouts: “Aesop’s Fables, II” (2005), on the MIT campus outside the Frank Gehry-designed Stata Center, and “X-Delta” (1970) at Dartmouth College’s Hood Museum in Hanover, New Hampshire. But the one to see is his terrific “Huru” (1984), which is parked on the front lawn of UMass Boston as part of its Arts on the Point outdoor sculpture park. It resembles a giant magnet on a tripod (a bit like the base of "Origins"). It’s 30 feet tall and weighs some 30,000 pounds. It’s a behemoth. 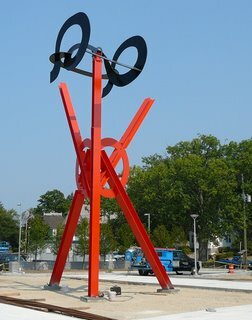 But what makes it so great is that the 6-ton horseshoe-shaped magnet thing is carefully balanced so that it teeters and slowly, amazingly gracefully pivots in the harbor breeze.